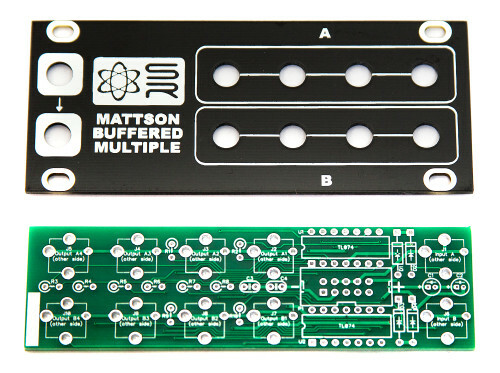 Thank you for purchasing the Synthrotek Eurorack 1U Mattson Buffered Multiple Module kit! This is an intermediate build as it has many stand-up resistors and tight soldering. If you feel like you can handle it please proceed! If not, get some help from a friend with experience or purchase a fully completed unit. ATTN: Please follow the BOM and these instructions and don’t populate from the PCB alone. Also sometimes we cannot get the exact pictured components, so please look over your parts and check the codes first. Lets begin! Place the IC Sockets by aligning the notch with the notch graphic on the PCB Silk Screen. 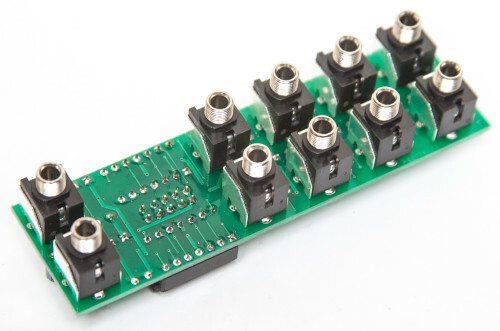 You will need to get the sockets as close to the outer edges of the board as possible so that the 10-pin connector will fit in easily between them. To do this, turn the board over on a flat surface and solder ONE leg into place on each socket (it doesn’t matter which one). Then holding the board in your hand with your thumb on the socket, touch your iron to the leg you soldered and push the socket toward the edge of the board, keeping it flat. Do this to the other socket as well, and then solder the rest of the legs in. There are quite a few resistors that need to be installed standing up. It is helpful to bend over one of the resistor leads first before populating each resistor. Solder and clip leads. Add the non-polarized capacitors as shown below. Next, make sure you orient the electrolytic capacitors in correctly. The longer lead needs to be inserted into the hole that has the “+” marking near it. Turn over to solder and clip leads. Next add the 10-Pin Eurorack Power Connector in place by matching the key notch with the key indicator on the PCB silk screen. Turn over and solder on a flat surface. If you didn’t move the IC sockets to the edge of the board in the earlier step, the header will still fit! It’s just a tight fit. Then add the ICs by aligning the notch of the IC with the notch on the header and pcb silkscreen. Now place the jacks on the other side of the pcb as shown below (do not solder just yet!). You can now solder the jacks in place. After you have soldered all of the jacks you are ready to test your module! Start by plugging in a CV signal from a sequencer or a MIDI to CV module into INPUT A (top left jack inside a white box). Since INPUT B (bottom left jack inside a white box) is normalled to INPUT A, you can test all available 8 outputs. Plug a cable into a 1V/O INPUT on an Oscillator and plug the other end of the cable into one of the OUTPUTS on the 1U Mattson Buffered Multiple. Make sure that each of the 4 “A” OUTPUTS and the 4 “B” OUTPUTS are all making precise copies of the INPUT A signal by monitoring your Oscillator’s OUTPUT. Plug a cable into a 1V/O INPUT on Oscillator #1 and plug the other end of the cable into one of the OUTPUTS on the 1U Mattson Buffered Multiple. Plug a cable into a 1V/O INPUT on Oscillator #2 and plug the other end of the cable into one of the other outputs on the Buffered Multiple. From here it’s best to get both Oscillators in tune with each other so you can hear them both reacting the same way to the INPUT A signal. Make sure that each of the 4 “A” OUTPUTS and the 4 “B” OUTPUTS on the Buffered Mult are all making precise copies of the INPUT A signal by monitoring the OUTPUTS from both Oscillators #1 and #2. Keep the INPUT A signal plugged in from the previous test as we’ll break the INPUT normalling by plugging in a CV signal from another sequencer or a MIDI to CV module into INPUT B.
Plug a cable into a 1V/O INPUT on Oscillator #1 and plug the other end of the cable into one of the “A” OUTPUTS on the 1U Mattson Buffered Multiple. Plug a cable into a 1V/O INPUT on Oscillator #2 and plug the other end of the cable into one of the “B” OUTPUTS on the Buffered Multiple. Make sure that each of the 4 “A” OUTPUTS and the 4 “B” OUTPUTS are all making precise copies of their respective input signals by monitoring the OUTPUTS from both Oscillators #1 and #2. By now you should be able to confirm that all INPUTS and OUTPUTS are working correctly on the 1U Mattson Buffered Multiple and that your unit is working correctly. If you have any questions or need help debugging, please first refer to our troubleshooting guide BY CLICKING HERE. If this gets you nowhere, please contact us by email for support. Thank you again for purchasing your kit from Synthrotek!